Include a replacement CR2016 battery for $1.25? If you like, we can set the time on your new watch to the timezone of your choice. This service costs $5.00. Color: Silver, with burnished silver band. Can speak the current date. Can announce time every hour. Spoken instructions guide you through every setting and feature. Silver watch with burnished silver metal band. 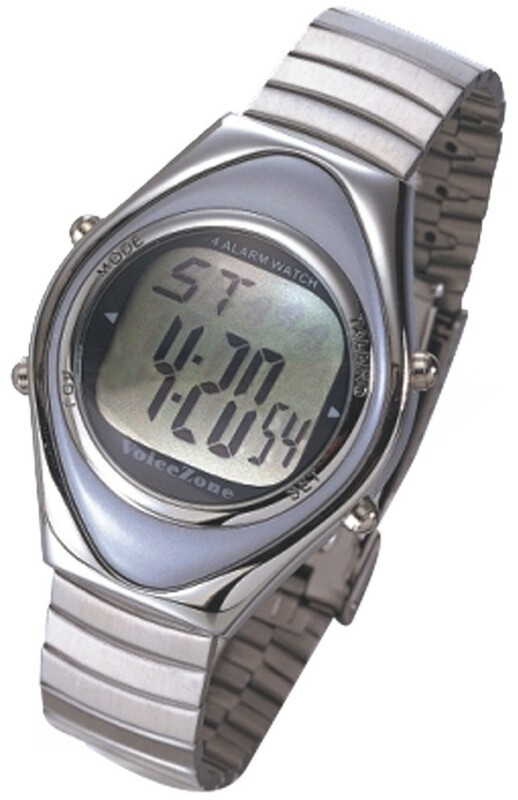 Durable, comfortable, water-resistant digital watch with fully adjustable band. Buttons are located on the rim of the watch. Adjustable metal band with buckle for a perfect fit. Runs on one CR2016 button-cell battery (included). Measures about 2 in by 1-1/2 in by 1/2 in. Package Weight: about 8.5 ounces. Here's a top-of-the-line, heavyweight, and durable mens talking watch - on which you won't find a trace of cheap plastic ... anywhere! 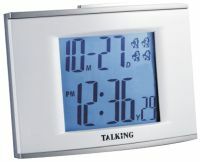 The features on this stunning digital chronograph watch include four alarms for use as daily reminders, crystal-clear speech, a talking stopwatch, hourly chime, and a date-announce function. It even has a metal band that adjusts and buckles around your wrist, insuring a perfect, comfortable fit. Directions for the Deluxe Talking Watch From Future Aids, The Braille Superstore.